I’ve wanted to know more about the architecture firm of Ramberg & Lowrey for years, and now it seems John Elliott of the Santa Ana History Room is researching them also. Let me share what I know, and perhaps one (or more) of my brilliant readers can fill in some gaps for us. Ramberg & Lowrey was based in Santa Ana and worked on a number of projects throughout Orange County in the 1960s, including the Santa Ana Police Department headquarters, a nursing home in Dana Point, and the North Broadway Law Building in Santa Ana. Most notably, however, they teamed up with Richard Neutra to design buildings for the County of Orange, including the County Communications Center and the Central Justice Center [a.k.a. the Orange County Courthouse (1968) in Santa Ana]. Donald Albert Ramberg was born 8-21-1919 in Fargo, North Dakota. Prior to partnering with Lowrey, he worked with A.C. Martin & Associates. Ramberg also designed the Santa Ana Elks Lodge. It appears he was still living in Southern California as recently as the 1980s. Robert Sidney Lowrey was born 6-18-1925 in Arkansas. He died 9-25-1989 in Los Angeles County. Sorry about the grainy newspaper photo above, but it's the best I have to illustrate this post. 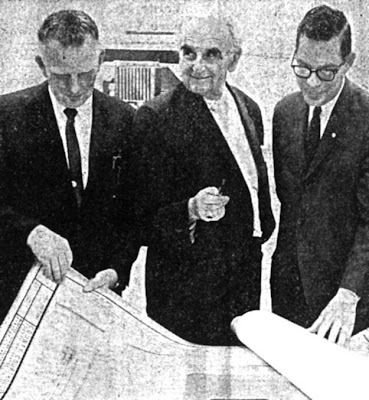 I believe it shows Ramberg and Lowrey flanking Richard Neutra (center) as they inspect plans for the Courthouse.